No more whining looms in the back studio. 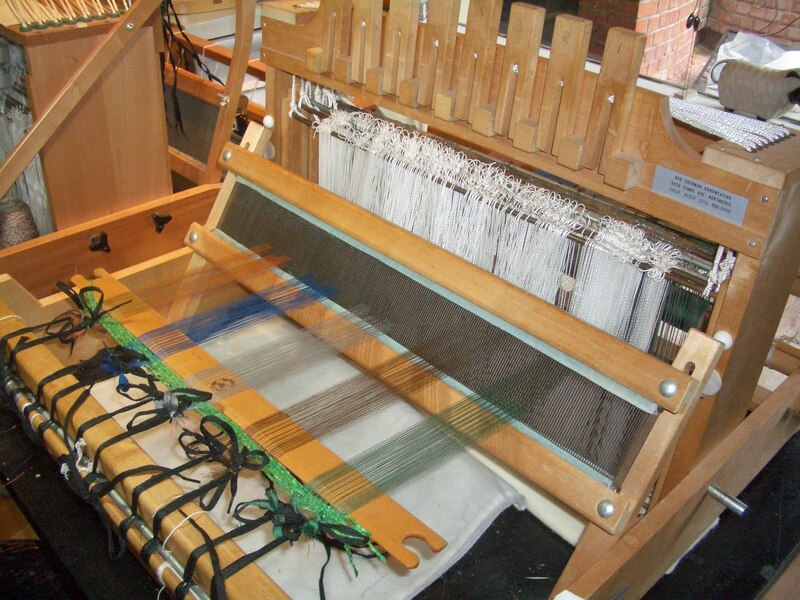 I have gotten two looms warped; my small tapestry loom as well as my eight harness Kothe Varpapuu shown to the left. My sixteen harness workhorse is empty yet happy in knowing its neighbor, the Varpapuu is testing different colored warps for the next beetle series which will be done on the 16 harness. I've warped five different colors of serger thread to do various sampling with the end result being a stack of bookmark note cards for the Designing Weavers show and sale in November plus a decision as to what color warp to use on my next series. For the first time, I tied on the sewing thread to an existing warp. Normally, I warp from the front filling the reed and heddles one by one. I thought tie-ing on the warp, which I do on other weaving projects would be faster. So I thought - why not try it? Having done it...I'm not sure which I prefer. It still seemed to take me a couple of days to get it all done...it was so boring making knot after knot after knot standing in one place. I kept taking breaks to relieve the back and the mind. The warp rolled onto the beam with about the same amount of hassle as the other method but the best part was...no errors to fix since all the warping errors were corrected in the previous weaving. So in summary - exceptionally boring to tie but in the end a faster road to actually weaving. Now if only the sun would come out. So what's in my back studio? 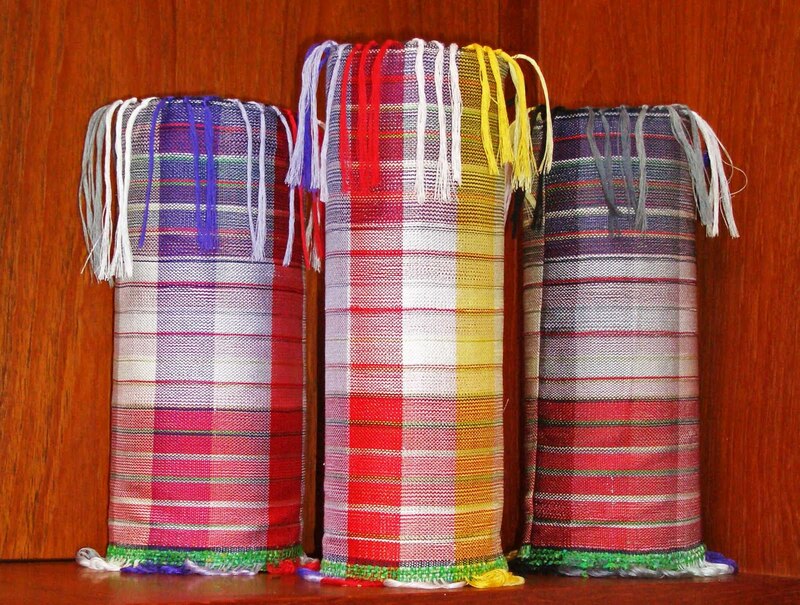 Here is something fun... taquete gamps in ten colors of warp woven with a 10 and 12 dent reed with one wet finished. I have always wanted to do this and I finally got the chance due to the convergence of two projects. The first was the challenge from our local guild - be inspired by a book from our guild library. I selected a book called Color Guide for Handweavers by Joyce Chown and Mary Black where the authors applied color theory to fiber. The second project was for my color study group; Centered on Color & Fiber. For this period, we were free to select any aspect of color/fiber we wanted learn about it, share it and exhibit it at our local guild festival. 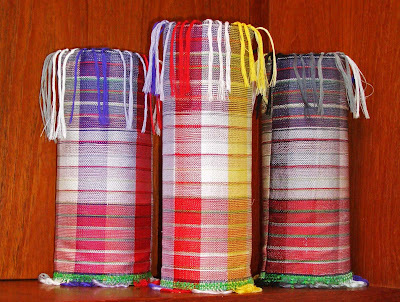 I decided to focus on acheiving better results in taquete through weaving a gamp. I generally weave my beetles with three wefts; generally with a light, medium and dark value plus one colored warp. No matter how hard I beat; the colors of the wefts not on top and the warp color peak out and impact the color of the weft on top. Hence I find it difficult to get the color I really want. I used three pattern wefts in the gamp; purple, white and red. Not my favorite colors but definately light, medium and a dark value. I then used a variety of permutations of 'hidden' wefts - those that travel underneath the color which is showing on top. I varied them by value and by saturated vs. unsaturated. Six permutations for each pattern weft. Gamps are not normally exhibited so I converted mine into free standing pieces. The variety in the colors from the different combinations of warp and hidden weft is quite amazing as is the difference between reeds and finishing. I am working on a new series of woven beetles and I would like the pieces to exhibit more vibrant and truer colors than my previous pieces. Based on these gamps, I am going with the 10 dent reed and will try wet finishing the pieces. Next I need to select the best warp color - more testing is required.